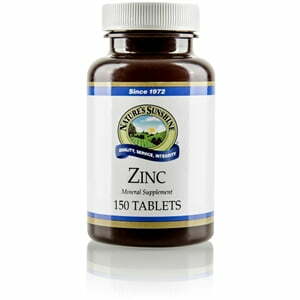 Nature’s Sunshine Zinc provides 166 percent, or 25 mg, of the daily value of this important trace mineral. Found in large amounts in the bone and muscle, zinc is one of the body’s most abundant minerals. Zinc supports a healthy immune system, helps metabolize sugar, assists in forming DNA, and encourages energy production as well as helping metabolize protein. Nature’s Sunshine Zinc is blended with an herbal base of kelp plant, alfalfa herb, and thyme herb. Cellulose (plant fiber) and magnesium stearate (vegetable).